Most wallpapers stretch a bit when they get wet with paste, and when drying, often there is a tiny bit (sometimes much more!) of shrinkage. This means you can end up with a teeny bit of your white wall showing inbetween the seams. I hung this Thibaut pattern yesterday, http://www.thibautdesign.com/collection/old_collection.php?productID=1414&patternID=200 and I was pleased to see that the manufacturer had gone the extra distance to try to prevent this shrinking. A couple of things helped: printing the paper on a thicker stock (backing), and using a dark grey stock – the idea being, if it does shrink, you won’t see the white edges of the paper, but grey instead, which is less noticeable. When you hang wallpaper, inevitably when you get to a corner, when cutting the paper to turn the corner (you never wrap paper around an inside corner – or “mostly” never), that means the pattern’s design is also going to be cut in half. Not a big deal – the second half simply gets placed on the next wall, lined up with the first half. But yesterday, installing this pattern by Thibaut http://www.thibautdesign.com/collection/old_collection.php?productID=1414&patternID=200 , EVERY SINGLE corner I came to, the flower pattern stopped BEFORE the corner. This was great! It meant no cut design, no pattern distorted by overlapping 1/8″, and gave me a bit more flexibility in placing the pattern on the wall (to keep all the flowers equally distanced from the ceiling). Even the last corner, which is virtually always a mis-match, came out with no cut designs! A wallpaper hanger buddy of mine (Don Dye), did a job a month or so ago in a loft-style townhome on Commerce Street in a developing area a bit east of downtown. Don had transported some tape and materials for me, so I drove over to his work site to pick them up. This also gave me a chance to spy on my buddy and his job – which involved a 2-story wall over a fireplace. It’s always fun seeing how someone else works, his techniques, tools, materials, etc. Well, last week I got a call to come look at a job in a new townhome a little east of downtown …. on Commerce Street. When I got there yesterday to do the bid, it turned out to be just one townhome complex away from where Don’s job was. Nice people, too, BTW, with some cool decorating ideas and innovative colors and patterns. It will be fun working on that job! You have to use caution when putting grasscloth in a bathroom. Those nice natural fibers tend to stain when splashed with water … around sinks, near towel racks…these are the places that tend to get botchy over time. Yesterday I discovered a whole new potential source of water stains…. I installed grasscloth in a powder room, and there was a nice vanity toped with travertine (stone). Well, the vanity top sloped just ever so slightly to the side. There was no lip or ridge around the flat top of the travertine, so water that splased onto the top ran along the backsplash right to the side of the vanity top – and onto the wall. That means onto the grasscloth. YIKES! This definately will cause a water stain if it happens enough. And the manufacturers of grasscloth these days…when they put dyes on the surface of the produce, rather than inside the fibers or in the paper backing, the color can come off. This was the case with at least some of the rolls of paper I put up yesterday. Of course, I was using the sink quite a lot, all day long, to rinse rags. I sure hope that regular use of the bathroom involves much less water, and that it won’t pool up or run onto the wall or wet the grasscloth. More than that, I sure hope it dries invisibly, and leaves no stain! Referring back to my previous post, back in those days (1920’s-’50’s), like I said, every room in the house was papered, and every surface…. Kitchens, bedrooms, living and dining rooms, hallways, bathrooms, ceilings, and even closets. Many homes had shipplapped wood structure, and “cheesecloth” was tacked over the uneven wood, to provide a smooth surface to attach the paper to. I don’t know what they did with plaster walls; possibly put the paper directly on the plaster. That was back when wallpaper was just that – paper. No plastic coating, no vinyl, no woven cloth backing… just paper and ink, and a selvedge edge, too, that had to be trimmed of and / or overlapped on the wall. My father said they would put layer over layer, each time they redecorated, until finally there were too many layers, and then the paperhanger would use a steamer to get it back down to the bare wall. Boy, I remember those steamers! How much was a truckload? It took 20,000 pounds of paper to fill up that truck! And the shipping company wouldn’t ship until it had a full load. So, that’s why they bought 20,000 pounds. Of course, back in those days, they were selling wallpaper left and right … people papered every room in the house – and not just walls but ceililngs, closets, etc. 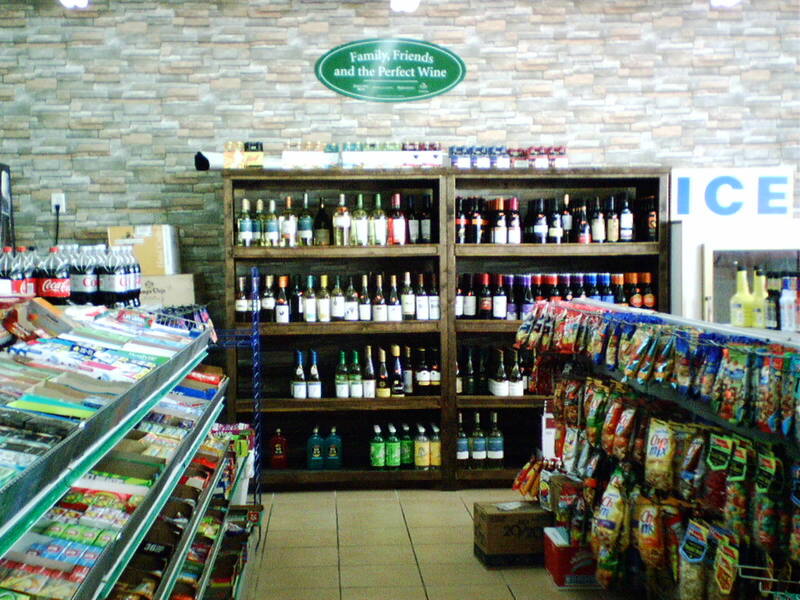 This convenience store sports a large wine selection, displayed in handsome wooden racks. The owner wanted to pump up the sophistication of his wine area. Anyway, it turns out that she knows my friend on that block, and they had even shared pet sitting duties for a neighbor. We had a nice few minutes chatting and catching up. Then my friend and I were walking across the street to look at some neighbors’ new landscaping, and the neighbor lady saw me and exclaimed, “Oh, I read your blog. In fact, I found Gregory by reading your blog.” So, she knows this lady painter, too, and hired her because of reading my recommendation on my blog. Just too small of a world!! But the client was convinced that she could find someone who was equally good, but cheaper. In fact, she had a friend who had highly recommended someone. So she got in touch with that friend, and got the number of the very good paper hanger, who worked at reasonable prices. She wrote the number down, and handed it to the designer. It was MY phone number! Incidentally, this is a very savvy designer, who does some super stylish and chic rooms (including one on my website gallery http://www.wallpaperladyhouston.com/wallpaper-gallery/). She’s been on HGTV and will soon be in an issue of a local decorating magazine. For the sake of descretion, I’m keeping names of both parties private right now. But once this job moves forward, I will post again and give this gifted designer a plug. You are currently browsing the Wallpaperlady's Blog blog archives for June, 2012.